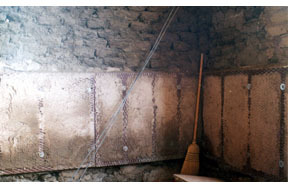 The hard plaster is cut and removed, revealing the damaged wall beneath. 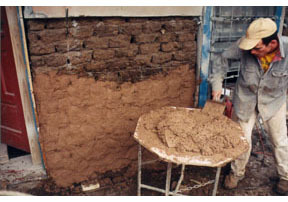 A lime-rich mud is cast onto the damaged wall without removal and replacement of adobe. 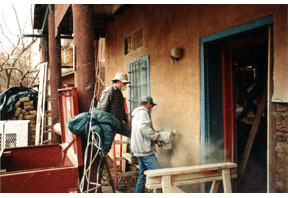 Mud is cast onto the steel "cage," a frame that is one inch thick and fabricated on-site to fit the building's pathologies. Once in place, holes are drilled through the wall to match up with the cage on the opposite side. 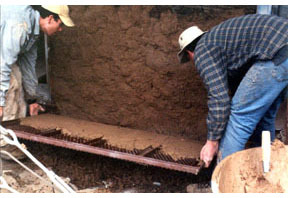 All-thread through bolts are used to draw the two cages together and sandwich the damaged wall. 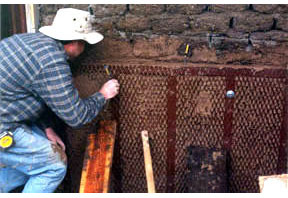 The cages are left essentially flush with the vertical plane of the walls and can be plastered over without the use of lath.